I have a clean and simple card today. I used the FTL52 sketch from the Clean & Simple blog. I finally had a chance to use one of the new Papertrey Ink sets, Everyday Button Bits. It's such a cute and fun set! 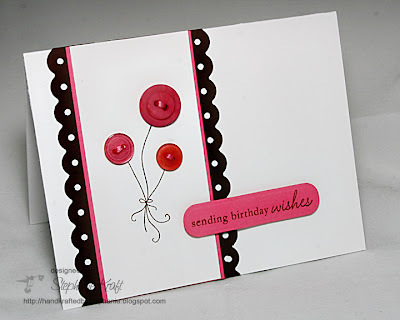 My card is pretty straight-forward... a happy birthday bouquet of button balloons (say that 4 times fast!). For some reason the dark cardstock looks black, but IRL it's dark brown! Accessories: Labels Trio die (Spellbinders), Cuttlebug (Provo Craft), Threading Water border punch (Fiskars), Buttons, Embroidery Floss (DMC), Foam Tape (3M). Such a cute card. I was late putting my order in and they sold out of the set. I'm trying to hold out til the next release, lol. Love the buttons as the balloons, and that pink/black combo is STUNNING!